ГЕРОЇКА In Polish captivity – Благодійний фонд "Героїка"
Even after signing of the Riga peace treaty (1921) between Poles and Bolshevists, UPR (Ukrainian People’s Republic) army had not stopped the national liberation struggle, which continued since 1917. Fighting Ukrainian army was retreating to the west and, as soon as it has crossed the river Zbruch, was interned to the camps of former ally – Poland. Under such conditions Ukrainian Command had preserved the structure of the army, cossacks haven’t fled in all directions, and the idea of an armed liberation of Ukraine was cultivated among the soldiers. Even behind the barbed wire Ukrainians, exhausted in battles, did not lose heart, created themselves conditions for complete socio-political and cultural life. Perseverance of Ukrainian army in extremely difficult conditions of internment (disarmament, being held in barracks behind the barbed wire, deficiency of proper medical care and food provision), and especially in a bad psychological conditions, urgently required raising of soldiers morale. Only educated and patriotically trained citizen-soldier of UPR Army could withstand the test of severe hardship in a foreign land till the end without succumbing to despair and degradation. The reorganization of the army started in the internment camps. While conserving the headquarters and operations, the army had to become the foundation for future deployment on Ukrainian territory. So soldiers required the enhancement of their own education level and improvement of military skills. Captives had organized themselves for military training by establishing the integrated cadet school, academical courses at General Staff headquarters of UPR Army. The cossacks studied to obtain their first officer rank – cornet (“khorunzhyi”), in return officers had ability to improve their own military qualification and to climb the army career ladder. The Ukrainians textbooks and military regulations were printed. Churches were built, where the orthodox chaplains praised the word of God in Ukrainian language. In order to prepare new chaplains Psalm courses were founded. Those were founded with permission of Metropolitan Archbishop Yuri of Warsaw and Minister of public education prof. Ivan Ohienko. The appointed director of the courses was Mitered Archpriest Pavlo Paschevskyi, and trustee – General Oleksander Zagrodskyi. In Lancut veterans of UPR Army founded Military Department at Ukrainian People University, which was headed by General Mykola Yunakiv. Besides the aforementioned military educational institutions of general army importance, at every interned Division in all military branches, repeated sergeants and corporal courses were founded. Only during 1921, when nearly all Ukrainian interned army was in the camps, almost 1000 soldiers successfully finished sergeant courses, and more than 1200 soldiers – corporal courses. The camp residents founded their own printing house, where military journal “Military herald” and literature journal “Our star” were published. These publications employed Yevhen Malanyuk, Ostap Lutskyi, Varfolomiy Yevtymovych, Mykola Shapoval etc. Every camp of UPR Army published its own journal. The best of them were: “Iron rifleman” (Kalish), “Zaporizhian thought” (Pikulice, Wadovice) “Our star” (Lancut, Kalish), “New life” (Schepiorno, Aleksandrow-Kuyavski) and “Ukrainian trumpeter” (Kalish, Schepiorno). 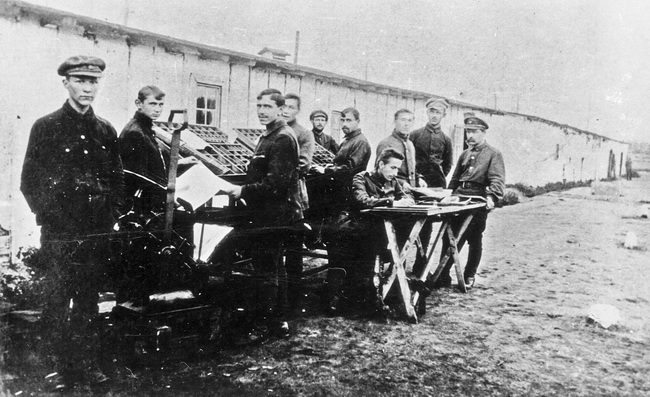 Printing house of 6th Sich Rifleman Division at the internment camp in Schepiorno (Poland). 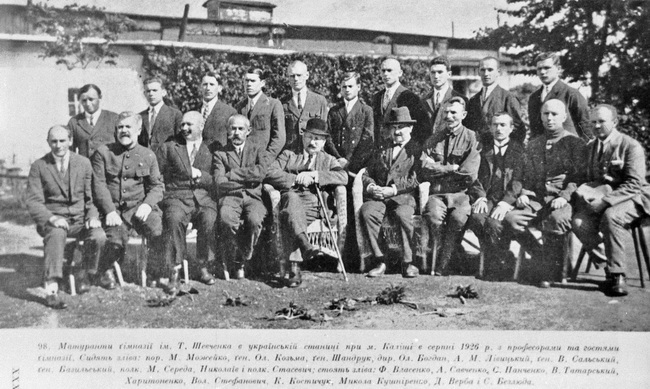 From right to left: Head of culturally-educational department of Division and the camp, Sotnyk M. Bytynskyi, Head of printing house I. Lypovetskyi, editor and corrector of “Ukrainian trumpeter”, Sotnyk O. Kostychenko (sitting). Schepiorno, Poland, 1923. In a short time illiteracy was almost completely eradicated. Special attention was paid to Russian-speaking cossacks and officers – they had classes by specialized teachers, writers, journalists, church brotherhoods and chaplains. All possible efforts were made that Russian-speaking soldiers ideologically and linguistically were integrated in Ukrainian environment. Teachers collective, students and guests of Taras Shevchenko gymnasium in Ukrainian village in Kalish. From left to right sits: por. M. Mozheyko, Gen. Ol. Kozma, Gen. P. Shandruk, Dir. Ol. Bogdan, A.M. Livytskyi, Gen. V. Salskyi, Gen. G. Bazylskyi, Col. M. Sereda, Nykolayiv, Stasevych; from left to right stands: F. Vlasenko, A. Savchenko, S. Panchenko, V. Tatarskyi, Harytonenko, Vol. Stefanovych, K. Kostychuk, M. Kushnirenko, D. Verba, S. Bezlyuda. Kalish, Poland, August 1926. Culturally-educational institutions of UPR Army in the internment were called to save cultural communication of internees with their Motherland. The prime example of humanitarian work among the troops were activities of culturally-educational unit of the 3rd Iron rifleman division, cossacks and officers of which were located at the camps in Polish town of Kalish. Thoughts about returning to Ukraine, reluctance to dissolve among the Poles, had pushed Ukrainians to creating their own “theatre behind the barbed wire”, where actors performed for cossacks and officers. Theater performances were both paid and complementary, where entrance fees were paid as a donation. All the money which was raised from the sales of tickets, were directed for a purchase of costumes, makeup, wigs and stage equipment. The repertoire was dominated by the plays of Ukrainian authors: “Burlaka”, “Palyvoda”, “Martyn Borulya” of Ivan Karpenko-Karyi, “Nazar Stodolya”, “Slave” of Taras Shevchenko, “Give freedom to the heart, It’ll lead into captivity” of Marko Kropyvnytskyi. The Director of the amateur theatre was cossack Oleksander Sosnytskyi. It’s interesting that under the direction of cossack-director played officers: Lieutenant Colonel Mark Ganzha and Sotnyk Yuriy Daragan. The latter was also known among immigrants as a famous poet and writer. This officer, born in Kherson region, was not only performing at the theatre, but also worked in the edition of the camp magazine “Rainbow”. One of the actors of the camp theatre – Sotnyk Yuriy Daragan. Even theatrical life in the camp was impregnated by militarism and discipline: the headquarters of 3rd Iron division had appointed three instructors to the group, which had to monitor the growth of “national and educational cause”. The theatre was not able exist only due to sales of the tickets, so it was supported by donations of richer officers. Like in the army, theater members filed reports on their activities every day. Only from June to July 1921 camp theatre had given 10 performances, spent 41 rehearsals with duration 89 hours. Theatrical performances were watched by 8110 viewers. In general, the theater had earned 35654 Polish Marks in two month. Also in Kalish, a soldier of UPR Army Vasyl Avramenko started his own dance school, which was joined by more than a thousand soldiers. After a year and a half of work, he had created a representative dance company, which even included several generals. His concerts, that included participation of the officer choir under direction of Sotnyk Sozont Kalmutskyi, were admired by the Kalish citizens and other towns of central Poland. Unfortunately, Avramenko had no permission to perform in the Eastern Polish provinces. 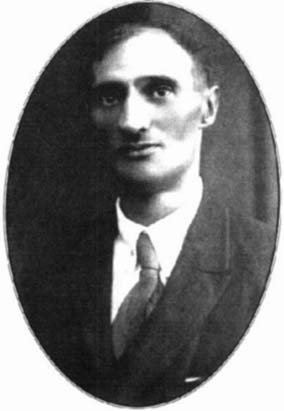 Therefore, he had chosen another way for popularization of Ukrainian Dance among population of Galicia, Holm and Volyn provinces: during the 1924 he organized a series of monthly courses of the Ukrainian dances on this territory, in particular for almost a hundred schoolchildren in Peremyshl. The level of self-organization and industriousness of Ukrainian military was impressive. Much of the cossacks and officers sought to secure their livelihood in exile, but the thoughts of the troops were not limited to the “daily bread” and a roof over their heads. Soldiers of UPR Army, exhausted by regular movement, endless battles and sick with typhus, were dying in camps in the early years of internment. A lot of kids have been orphaned. Specially created trustees committees cared for the fate of lonely, still very young Ukrainians. The widows of dead soldiers received financial assistance. To support the interned soldiers, Ukrainian diaspora collected donations around the world. Only Ukrainian students of Czechoslovakia, had collected in 1922 amount of more than 350 000 Polish Marks for needs of soldiers of the 3rd Iron Division. The various camps had active Steshenko Ukrainian gymnasiums, kindergartens with Ukrainian language of education, student communities, art studio headed by artists Zinoviy Podushko and Oleksa Stovbunenko, a number of societies in particular Society for protection Ukrainian language, Union of Ukrainians Women-emigrants, fellowship “Agronomist”, sport teams. In 1920 by efforts of UPR Army officers in Lancut collected donations for reburial of several hundred Ukrainian soldiers, which been buried early in various locations in Poland. At the city’s graveyard land has been given for Ukrainian military cemetery, a monument was erected to Ukrainian soldiers and exhumations have been performed. 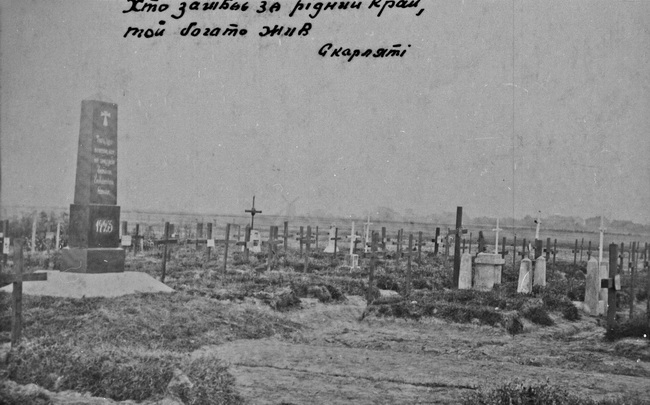 On February 1921, with participation of chaplain priest Mykola Marynych, a solemn consecration of the first Ukrainian military necropolis on Polish land was made, with more than 450 graves of both Ukrainian Galician Army and UPR Army soldiers. As in Lancut, in Schepiorno village near Kalish, Ukrainian military necropolis with a military monument was created. Cemetery of interned UPR Army soldiers. Schepiorno, Poland, 1923. Widow at the soldier’s grave. Schepiorno, Poland, 1923. 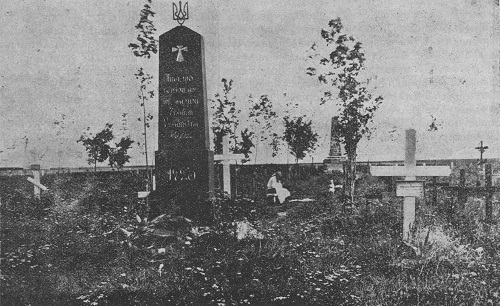 Soon after World War II, the Soviets had destroyed most of the graves of the UPR Army soldiers in Poland. Approaching by triumphant march to the west, Bolshevists searched for already died UPR Army soldiers to destroy even the memory of those, who fought for freedom of Ukraine.